A physician and certified professional coder reflects on the problems navigating the current maze and offers a possible solution. 1. There are two different sets of rules, and they both are lousy. The first set of E/M guidelines was released in 1995, followed shortly thereafter in 1997 with another version. Doctors get to choose which version they want to use when completing their documentation. Unfortunately for them, both are bad. The 1995 E/M guidelines are so vague that they are essentially meaningless—especially where the physical exam is concerned. Their 1997 counterparts were created to address the ambiguity of the 1995 rules but went overboard in the other direction. If the 1995 exam rules are difficult to follow because they are ambiguous, the 1997 set is even harder to follow because it is too rigid and arbitrary. The end result is two different sets of rules, neither of which works very well. If it were possible to mix and match elements of each set of guidelines, we may be able to come up with a workable solution, but for some reason, all Medicare carriers say this is expressly forbidden. 2. The 1995 physical exam rules are too vague. Let’s face it, nobody knows how to follow the rules for documenting the physical exam contained in the 1995 E/M guidelines. First, physicians are told they can use either organ systems or body areas. Then they’re told the comprehensive exam can only be completed by using the organ systems. And don’t even get started on trying to tell the difference between expanded-problem-focused and detailed exams. An expanded-problem-focused exam requires “a limited exam of the affected body area(s) or organ system(s),” while a detailed exam requires “an extended exam of the affected body area(s) or organ systems(s).” In other words, the only difference is the word “limited” vs. “extended.” (By the way, that’s not clarified.) This is not a trivial matter because an expanded-problem-focused vs. a detailed exam can make the difference between a level 3 vs. a level 4 established office visit or a level 2 vs. a level 3 hospital progress note. In both cases, the difference in reimbursement is more than 40%. 3. The 1997 physical exam rules are too inflexible and arbitrary. In an attempt to provide clarity, the 1997 E/M guidelines introduced the concept of physical exam “bullets.” The theory was that doctors could simply count the bullets documented to figure out the level of exam provided. The problem is that the bullets themselves are not very well thought out. For example, using the general multisystem exam, the musculoskeletal system can generate a total of 24 bullets, whereas the neurological system maxes out at three bullets. Besides being an insult to the entire neurology specialty, this apportioning of bullets just doesn’t make sense. In addition, certain routine exam elements inexplicably failed to make the cut when they were handing out the bullets. (You get no bullets for listening for bowel sounds, which is a routine part of even the most cursory exam.) However, even with these shortcomings, the 1997 exam rules work pretty well for the first three levels of the physical exam. However, trouble ensues when we get to the comprehensive exam. According to the guidelines, a comprehensive exam not only requires 18 bullets, but these bullets must also come from nine different organ systems. The bottom line is that this magical combination of bullets and organ systems is unlikely to happen by sheer chance. The result is that many physicians who think they are performing comprehensive physical exams really aren’t—unless they happen to have the foresight to plan it all out ahead of time. 4. Different states, different rules. Medicare is a federal program, so you would think the rules would be the same across the country. Not true. Medicare utilizes private contractors, called Medicare carriers, to administer the program in different states. Each carrier is given astonishing latitude when it comes to interpreting the E/M guidelines during the auditing process. The result is a hodgepodge of contradictory rules that vary from state to state. In fact, the TrailBlazer Medicare carrier actually created a completely new set of rules to quantify the key component of medical decision making. As a result, physicians practicing in Colorado, New Mexico, Oklahoma, Texas, or Virginia face more stringent requirements to qualify for any given level of medical decision making. 5. Nobody (and I do mean nobody) knows how to document a history of present illness (HPI). This may be surprising, but it’s true. To be fair, there are some things physicians do know, like that they can qualify for a brief HPI by using one to three HPI elements. This is true for both the 1995 and 1997 E/M guidelines. They also know that documenting at least four HPI elements qualifies for an extended HPI. Again, this is true for both the 1995 and 1997 E/M guidelines. But then things get dicey. The 1997 E/M guidelines state that physicians can qualify for an extended HPI by commenting on the status of three or more chronic or inactive problems. Nowhere is it made clear what is meant by chronic or inactive problems, but let’s ignore that for now. The bigger question is whether physicians can employ this same approach when completing an extended HPI under the 1995 rules. The answer appears to be yes … and no. Nowhere in the 1995 rules is there a mention of anything about “chronic or inactive problems” when it comes to an HPI. But the guidelines do state (on page 6) that an extended HPI should describe four or more elements or “associated comorbidities.” What does this mean? It seems to indicate that you can qualify by commenting on four comorbidities as opposed to the three chronic or inactive problems required for the 1997 rules. But really, who knows? 6. Physicians can’t figure out their own medical decision making. The official rules for calculating the medical decision making contained in both the 1995 and 1997 E/M guidelines are too ambiguous to be useful in daily practice. It’s obvious that the Centers for Medicare & Medicaid Services (CMS) realized this early on because it subsequently circulated a medical decision-making point system to all Medicare carriers to be used on a “voluntary” basis. This point system is objective and intuitive and actually works pretty well. The problem is that the CMS forgot to send it out to the doctors. In fact, the point system appears nowhere on the official CMS Web site and has never been officially adopted by the federal government. Some Medicare carriers do educate their doctors about using the point system and some don’t. The end result is an official miasma of confusion when it comes to quantifying the most important key component of medical decision making. 7. Physicians may not get credit if the patient is unable to give a history. If a patient is in a coma and unable to give a history, the physician may not get paid for the visit. In other words, if a history can’t be recorded due to the clinical circumstances of the patient, some auditors will not give credit for this key component. To be fair, there is one little phrase in the 1995 E/M guidelines that takes a stab at this issue: If the physician is unable to obtain a history from the patient or other source, the record should describe the patient’s condition or other circumstance which precludes obtaining a history (page 5). But this doesn’t really let physicians off the hook. All it says is that they should explain why a history could not be documented. There is no universal policy stating that doctors should get relief in this situation, so it is treated differently by different carriers. Some auditors are so literal when applying the E/M guidelines that lack of a history (no matter what the reason) will result in automatic downcoding. 8. Shortcuts may actually be pitfalls. Documenting patient encounters is boring and time consuming. For this reason, any shortcuts that can streamline the process are much appreciated by physicians. Perhaps the most popular is the one used during the review of systems when doctors note, “All other systems reviewed and are negative.” According to both the 1995 and 1997 E/M guidelines, it is acceptable to list the most pertinent positive and negative findings from the most relevant systems and then use the “all others negative” blurb to convey the fact that all the other systems were reviewed as well. Unfortunately for physicians, some Medicare carriers have arbitrarily decided to stop honoring this shortcut. The result is that physicians who have taken the time to actually read the E/M guidelines and discovered this shortcut may be in trouble if they live in a state where it is no longer acceptable to use it. If an audit were to occur, the outcome could be devastating. For example, suppose a level 3 history and physical (99223) is performed and documented on a sick patient being admitted to the hospital. If the review of systems shortcut is taken and the carrier no longer recognizes this shorthand as legitimate, the case will be automatically downcoded to a level 1 history and physical (99221), resulting in a decrease in reimbursement from $193 to $93. 9. No one teaches us this stuff. I went through four years of medical school, three years of residency, and three years of fellowship without one second of E/M coding and documentation education. If doctors are going to learn this stuff, somebody needs to teach them. 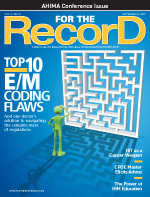 When physicians have specific questions about E/M coding and documentation, there is no single place for them to turn for answers. While it’s true that every Medicare carrier has a Web site, they are often difficult to navigate, making it unlikely physicians will find specific answers to specific questions. Inquiries about anything involving E/M coding are usually met with a link to the official E/M guidelines. Hard facts about how that carrier actually interprets the rules are far and few between. The best solution would be surprisingly simple. First, the federal government should officially recognize the medical decision-making points system and apply it equally across the entire country. This would give doctors in all states equal footing when it comes to quantifying their cognitive labor. Next, the specific requirements for any level of history and exam should be thrown out the window and the level of care for any encounter should be dictated solely by the key component of medical decision making. Of course, doctors would still perform and document some history and some physical exam, but the details would be left up to the examiner based on the clinical circumstances of the patient. This novel concept could be dubbed “cognitive coding” because doctors would get paid for actually thinking about the patient instead of checking off bullets. It’s a tall order, but change is in the air, right? Why not corral some of the energy of the current healthcare reform movement to overcome the institutional inertia of a flawed documentation system? This is one change that all doctors can believe in. — Peter R. Jensen, MD, CPC, is founder of www.EMuniversity.com, a Web site devoted to clinically driven evaluation and management compliance education.